Although cat behavior may be difficult to understand at times, looking to their wild relatives can offer some insight as to why cats sometimes have trouble coexisting. Yet there are steps you can take to help your cat accept a new kitten. Why Do Cats Reject New Kittens? Domesticated house cats are closely related to wild cats and even more so to feral cats. There are a number of differences, but these groups still have some similar characteristics and instincts, including how they coexist with other cats. Wild felines, such as bobcats, lynx, and servals, are typically solitary animals. They're rarely seen, naturally secretive, and nocturnal. During the day, they hide in dens, and they come out at night to hunt for food alone. Feral cats also hunt and sleep alone. However, they may form a colony led by a queen cat if food is being provided to them by people. The dominant queen mates with feral tomcats who do not live with the group and produce litters of kittens. The other cats in the group, including maturing kittens, are submissive to the queen. They don't stay around long if they're not submissive or if they unsuccessfully try to challenge the queen. This social hierarchy is different from that of the average house cat. That's because house cats are domesticated, usually spayed and neutered, often not well socialized with other cats, and live in a very isolated environment away from other cats. This can present a problem when you want to bring a new kitten or cat into the family. Sometimes, giving your cat time to adjust to a new kitten is what's needed. But if your cat was not well socialized before the age of 3, it may be very difficult for it to get along with a new kitten. In reality, some cats are better off being the only cat in a home. Others may not like a specific kitten but may take to another one based on its personality. When you bring a new kitten home, it's important to slowly introduce it to your cat. Whether you've done that or not, if the cats aren't getting along, there are a few steps you can take to try to break the ice. Make sure the kitten has its own food and water bowls that are not in the same location as your cat's bowls. Feed them in separate areas so your cat doesn't become territorial about its own food and your kitten gets a chance to eat. If you need to, feed one of the cats in a separate room and close the door. Get out the feather wand or another interactive toy and allow both cats to play together. An older cat may be standoffish at first, but it's hard for most cats to avoid the temptation of a fluttery toy when they see it. This may show your cat that the new kitten enjoys the same things and thus may not so threatening after all. Provide separate sleeping areas for both cats. Don't try to give your cat's old beds or condos to the new kitten. Your older cat has already established possession of these and won't take kindly to a kitten using them without permission. Provide your older cat with areas outside the kitten's reach where only it can go. A high perch, for instance, can be a good place for your cat to observe the kitten for a while. Also, these places can be a good retreat when your cat needs to get away from an aggressive or annoying kitten. Make sure you have one more litter box than you have cats. This means that if you have two cats, you should have three litter boxes. There should be no direct line of sight between the boxes in case both your older cat and new kitten are in different boxes at the same time. Purchase sprays, wipes, and diffusers containing special feline pheromones and use them as long as necessary. These pheromones help cats feel relaxed and safe and may benefit both your new kitten and older cat during the introduction phase. Pet your new kitten and, at the same time, allow your older cat to sniff you while you give it its favorite treats. This may help to teach your cat that the scent of the new kitten is not a bad thing. 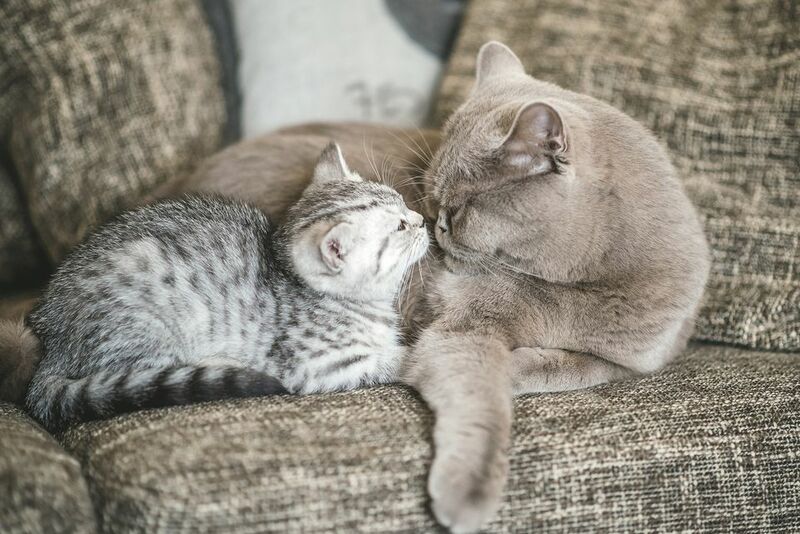 Over time, your older cat may start to associate the smell of the kitten with treats, making it a positive scent. Do the same thing when you see your kitten and cat interacting nicely to reinforce their desirable behavior. If you're unable to monitor your cat and kitten and are worried about one hurting the other, make sure they're safely separated. A bathroom with a litter box, bed, and bowl of water can be where one of the cats stays when you're away at work or asleep at night. This is especially helpful if your kitten won't leave your older cat alone. Sometimes unusual things that scare a cat will cause it to show displaced aggression toward a new kitten. Cats are creatures of habit, so don’t make major household changes while introducing the new kitten. This includes such changes as renovating your kitchen, ripping up carpeting, or having a party with fireworks in the backyard. While they may want to fight, don't allow your cat to do anything more than hiss and swat at the kitten. If you're concerned that a fight is about to happen, distract the cats with a loud clap of your hands or a quick squirt of water.